Piedmont, in the north-western corner of the Italian Peninsula, is arguably Italy’s finest wine region. The name Piemonte literally means ‘the foot of the mountains’, as the region sits at the foot of the Western Alps, which encircle the region to the north and west, forming Italy’s naturally formidable border with France. To the south lie the Apennine Mountains which divide Piedmont from its long, thin neighbor Liguria, which is all that separates Piedmont from the Mediterranean Sea. While Piedmontese winemaking has always benefited from the favorable climate, it wasn’t until the region’s mountain defenses were successfully breached (first by the Romans, then repeatedly by the French) that advanced oenology finally arrived here. The introduction and regular updating of foreign winemaking technologies is one of the main reasons that Piedmont remains so viticulturally advanced compared to other Italian regions. The region’s proximity to France also plays a part. Piedmont is often described as the ‘Burgundy’ of Italy, a reputation due to its many small-scale, family wineries and a focus on quality which sometimes borders on obsession. What Burgundy does with Pinot Noir, Piedmont does with Nebbiolo – not the region’s most widely planted grape, but the one which has made the largest contribution to the quality and reputation of its wine. 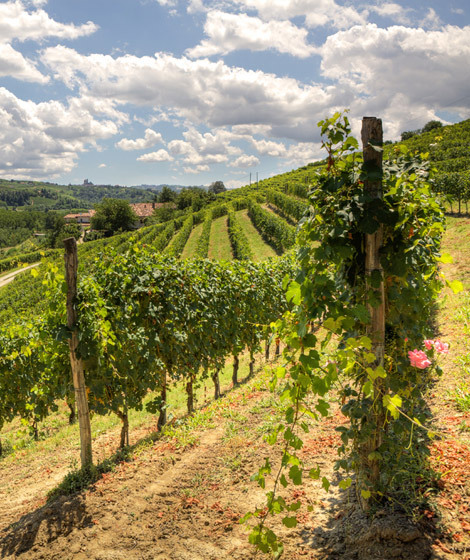 Nebbiolo grapes are behind two of Italy’s finest reds: Barolo and Barbaresco. Nebbiolo is a late-ripening grape which takes its name from the word nebbia (fog) which is typical of the area especially in the morning. Names like Bussia, Cannubi, and Brunate have graced Barolo bottles since the 1700s. 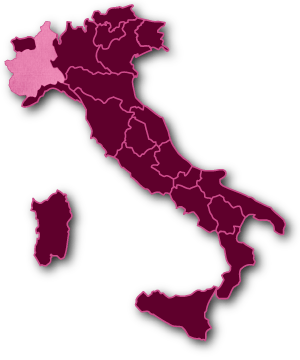 Barbera is Piedmont’s workhorse grape, although it is responsible for a growing number of superlative wines, sold mostly as Barbera d’Asti or Barbera d’Alba. Barbera-based wines from Piedmont are classically Italian: tangy reds with good acidity and aromas of fresh plums and dark cherries. Barbera is an excellent food wine and consequently it is Piedmont’s most widely planted red variety. Dolcetto is another red grape of Piedmont. Although its name means ‘little sweet one’, Dolcetto is usually used to make dry red wines with an appetizing, gently bitter finish. Brachetto is also worthy of mention, not least for its role in the sweet, sparkling reds of the Brachetto d’Acqui. Ruche’ is also a semi-obscure indigenous variety that is grown in the area around Castagnole di Monferrato. Although Piedmont is known as a red-wine region, there are also several white wines which are growing in popularity: Moscato d’Asti is crowd-pleasing, Gavi is the Piedmontese white of the connoisseur (made of cortese grapes), local Arneis, and even the ever-successful Chardonnay. With more DOCGs (15 as of December 2010) and DOCs (45 and climbing) than any other Italian region, and about 40% of its wine produced at DOC/G level, Piedmont is challenged only by Veneto and Tuscany for the top spot among Italian wine regions.